Humble Meals: Creamy Chicken Potato and Cauliflower Soup. "Ever since I moved down south I learned to appreciate the power or a warm bowl of soup on a cold winter night. The thing about soups is that even when your fridge has slim pickings with a little love and some creativity you can always make it work". The way I approached this "recipe" was by NOT following one. For creamy soups that are made with starchy vegetables such as potato, I learned the best way to cook it is by roasting (in this case) the potato and the cauliflower. To create the flavor base for ANY soup you need to sautee some veggies. Onions, garlic, celery or whatever you have available (mushrooms, leeks, carrots, shallots). For this specific soup I used celery, onions, and garlic. To build your soup you need liquid. Add your broth of choice (vegetable, chicken, veal, organic, etc), and milk (whole, reduced or in my case fat free). If you don't have milk you can always use heavy cream, plain yogurt, or evaporated milk (just eyeball it until desired taste and consistency). Puree everything on the blender. When it comes to toppings the sky is the limit. For this soup, which by the way, the photo is a quick snapshot of my plate (with no photo styling whatsoever), I added chicken, crumbled bacon, and shredded cheese. Other great options for this soup could be green onions, sour cream, roasted corn, avocado, broccoli, tomatoes, or ham. The thing is there's is no need to feel intimidated by making a soup. What's the worst thing that could happen? You burn it? Do it again. You didn't like it? Adjust the ingredients. Remember, when it comes to cooking my motto is practice, practice, practice. So what are you waiting for? Let's get cooking!! All of the toppings reminiscent of a baked potato (ie. scallions, cheese, sour cream, broccoli and bacon) are great for a soup like this. Because it's creamy, it also has the ability to serve as a filling dinner. 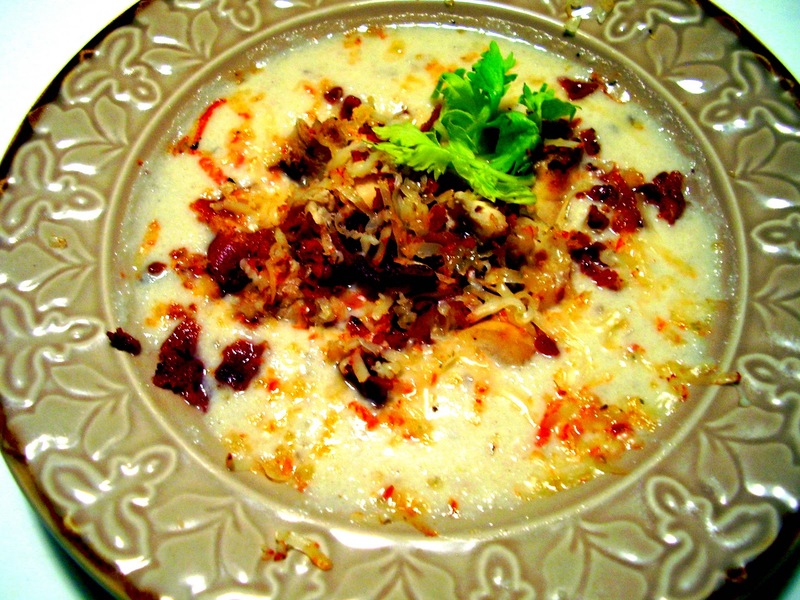 No more should soup be relegated to the appetizer course!